Nestled among the trees along peaceful Fish River, this hand-crafted home combines rustic charm with state-of-the-art amenities. Imagine fun-filled days on the river swimming, fishing, bird-watching, relaxing on the two docks, and kayaking or paddle boarding. One adult kayak, one child kayak, and a stand-up paddle board are available at the house for your enjoyment. Spend a leisurely afternoon kayaking down the river and perhaps making a stop at Big Daddy’s Restaurant for a yummy bite or a sweet tea or a cold beer. Back at the house, relax in the hot tub on the covered deck. Or enjoy playing air hockey or foosball in the game room. A selection of board games is also available. Unless of course the comfortable living room couches and television are calling your name after a day of river activities! As the sun goes down, fire up the grill and indulge in an outdoor feast on the deck. Or prepare a delicious dinner in the updated kitchen. State-of-the-art appliances and plenty of counter space make cooking a dream. Plus, there is a spacious eating area next to the kitchen if you prefer to dine indoors. The beach towns of Gulf Shores and Orange Beach are nearby, as well as the quaint town of Fairhope. 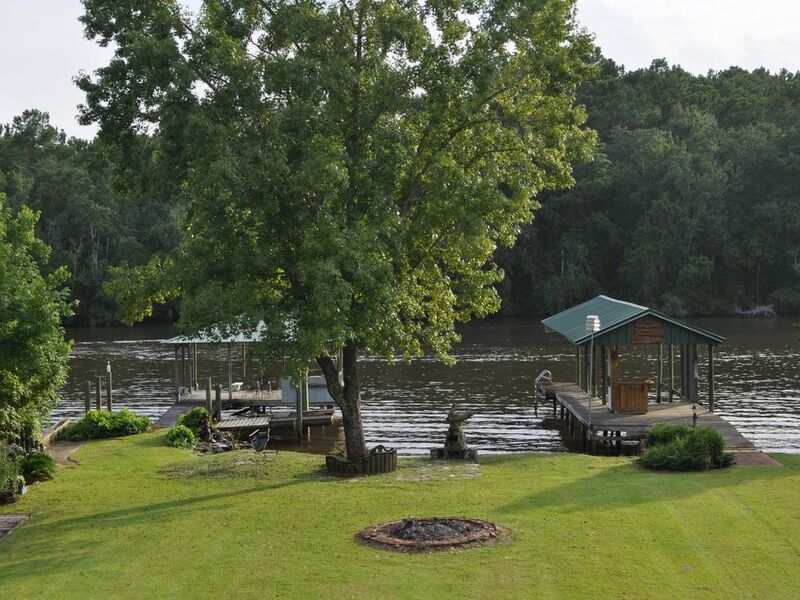 This idyllic Fish River hideaway is centrally located between Fairhope, Foley, Gulf Shores, and Magnolia Springs. We hope to see you soon for your next riverfront getaway! I'm a lover of making memories and having wonderful experiences. I want guests of Fish River Hideaway to make great memories and to have wonderful experiences as well. I'm not big on possessions but this property is my proudest possession. I grew up in this house. I learned to swim here, I experienced weather events such as several hurricanes, tornadoes and floods. However I mostly remember how I had so much fun and laughed millions of times over. It gives me great joy to allow travelers from all over the world to stay at my place to enjoy Fish River and the surrounding area. This house was built in 1983 by my parents. The label below that says "Daryn McCullough purchased this House in 2018" is misleading as I don't control that part of the template. Sadly, me and my siblings inherited this house in early 2018 after the death of our mother Marjorie. My parents put their lives into this house and I'm carrying on their legacy and I hope to one day retire here and work my dream job of delivering mail by boat for the Magnolia Springs Post Office. It's my dream job and I'm just hoping the USPS is still delivering mail then. But until my retirement in the year 2046 - 2048?, this will be a rental property for travelers to enjoy. Also I like Alabama Crimson Tide football, making walk sticks, making silly YouTube videos and spending time with my cute toddler son Liam and my beautiful wife Shannon. We are located in the center of popular destinations such as Fairhope, Magnolia Springs, Foley, Gulf Shores and Orange Beach. Tourism is a huge business here in South Baldwin County and Fish River Hideaway is located a little off the beaten path but that doesn't mean its lacking charm. No far from it. Its quiet, its on a fresh water river resource, house amenities are modern and yet we are located between 20 - 40 minutes from all of those destinations I listed previously. So I guess what I'm trying to say is, this place is perfect! The question you have to ask yourself is, do I want a perfect place to stay? If the answer is yes, then look no further because Fish River Hideaway is the perfect place to stay. The property is situated along Fish River. Air Hockey, Foosball and board games. Thank you for a great stay. Love the location and charm here. Daryn is a great host. This place is a hidden gem. Beautiful scenery and entertainment to keep the whole family entertained. Plenty of room. Close to all the attractions but a nice quiet getaway from all the hustle and bustle. Well definitely try to return. Owner available to answer all questions and checks on you during your stay. There were just 2 of us. The bed was very comfortable. The location was at the end of a quiet road. The house was clean and well stocked. The neighbors were very friendly. The owner was very helpful. Go to Jesse's Restaurant in Magnolia Springs(expensive) or Big Daddy's(reasonable) just up river on the other side. We didn't have a family visit but it would be a great place for one. We were there a month. Great place for a family vacation! Plenty of room, with enough activities on the property to occupy us when we weren't playing tourist. The host was very responsive to my questions. We had no problem finding the place upon our arrival, (in the dark) given the instructions provided. Beautiful place with plenty of space to spread out and enjoy the natural beauty of the area! Plenty of things to do while in the area. Wish the water pressure was a little better in the showers, but other than that, had a great experience! We had a wonderful time sitting on the dock in the evening watching the sun go down, then playing board games into the evening. The home was very comfortable. Great for families with kids. It is tucked away on the road quite a bit so I would suggest arriving there in the day time when you first arrive otherwise the GPS has a difficult time finding the correct address. It is definitely a great vacation spot.